The English Captain, Alastair Cook butchered the Pakistani bowling attack by hammering his career best 137 runs and enabled his team to win the match convincingly by 130 runs in the first One Day International. England scored 260 runs for the loss of seven wickets in their allocated quota of 50 overs and Pakistan was bowled out for 130 runs with 15 overs to spare. Cook was chosen ‘Player of the match’ for his outstanding batting performance which laid the foundation for the victory. The match was played at Sheikh Zayed Stadium, Abu Dhabi (neutral venue), on February 13, 2012. Earlier, Alastair Cook won the toss and opted to bat first to get maximum use of the flat track by setting a reasonable target for the opposition. Kevin Pietersen was promoted in the batting order and he opened the innings with his skipper as the innings was initiated with vigilance without taking any risk. Pakistan started the bowling with Umar Gul and inducted off spinner Mohammad Hafeez from the other end and they gave away 48 runs without any success in the first 10 overs. Shahid Afridi was handed over the ball by Misbah-Ul-Haq in the 11th over and England collected four runs of it. Afridi struck in the 13th over when Pietersen was clean bowled on the third ball and Jonathan Trott faced the same fate on the very next ball. Ravi Bopara came in next and joined with Cook and both consolidated the innings for the visitors which looked like drifting away from them. The duo played spin as well as pace attack on the merit and ball visited out of the boundary lines quite often. 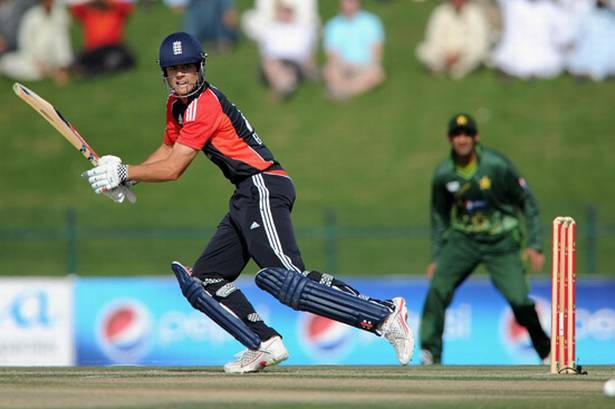 Cook achieved his third ODI ton in style by dispatching a four to Saeed Ajmal to the square boundary in the 36th over. Bopara earned his seventh fifty in the next over but was stumped on the first ball of the 38th over by Umar Akmal off Ajmal for 50 runs. The third wicket witnessed a partnership of tremendous 131 runs and the wicket fell at 188 runs. Ajmal took control of the game and continued picking up wickets at regular intervals and Cook became his fourth victim for 137 runs. Engalnd posted 260 runs on board which looked an achievable target keeping in view the batting strength of Pakistan. The fast bowling duo of Umar Gul and Wahab Riaz proved expensive and were punished for 100 runs in 15 overs. Ajmal once again proved his worth by grabbing five wickets and Afridi got two. Pakistan had a terrible start of their innings after losing two wickets for mere 11 runs and both were picked by the pacer Steven Finn. He continued the assault by grasping the next two wickets as the batsmen found it hard to tackle with his deadly bowling. The home side was in deep trouble after losing four top order batsmen for 40 runs and the batting became perishable. Umar Akmal and Afridi provided 28 runs partnership for the sixth wicket which was the highest of the innings. Afridi was the top scorer for 28 as the whole team was bundled out for 130 runs in 35 overs. Finn was the most successful bowler with four wickets, Samit Patel held three, Graeme Swann clinched two as Stuart Broad claimed one wicket. England won the first ODI with authority by a huge margin of 130 runs while putting aside their recent debacle in the Test series which was lost 0-3.